Welcome to EmbroidMe Perth CBD, your full service embroidery, garment printing and promotional products centre. Our large showroom stocks a massive selection of uniforms, clothing, hats, bags and promotional items. We recommend a visit, so you can see and try the garments and even borrow samples to show your team. 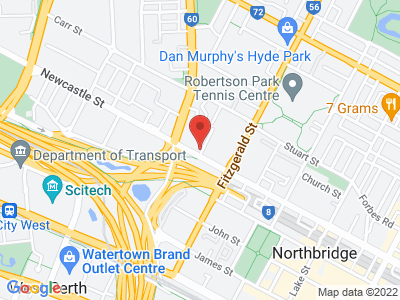 Conveniently located on Newcastle St near the Charles St freeway entry/exit and just a couple of minutes from the heart of the CBD, we have onsite parking for your convenience. EmbroidMe Perth CBD can custom decorate any type of garment and promotional product for your business including: Polo shirts, Hats, Shirts, Hoodies, Rain coats, Corporate Wear, Team Wear, Hi-Viz, Work Wear, PPE, Safety Gear, Chef & Wait Wear, Golf Balls, Business Gifts, Imprinted Promotional Products, Pens, Pencils, Mugs, Stress Balls and much, much more. Our on-site production facility uses the latest computer controlled embroidery machines and digital garment printing technology to produce custom clothing and uniforms for your business, team, club, school, association, charity, etc. We can provide the perfect promotional tools to advertise your products & services, while building your company brand. Serving Central Perth, Perth CBD, Northbridge, Highgate, Kings Park & West Perth, our large showroom stocks a massive selection of uniforms, clothing, hats, bags and promotional items. I recently engaged EmbroidMe for a few work items in my new business. Sophie was incredible, she was so quick and efficient in turning around the initial logo design setup and providing proofs to check before proceeding with anything. I am absolutely delighted with my uniforms, aprons and hats. Sophie was very helpful and provided me with great customer service throughout my order. They also don't have minimum order quantities on most things, so unlike other suppliers I was able to order minimum amounts that I needed in my first order - which is why I also chose them. I will definitely be a returning customer and very happy with the quality, cost and service provided. Email: PerthCBD@EmbroidMe.com.au We will be closed for the Easter / ANZAC Holiday week and will not open on 23 /24 /26 April.